Peter: Bedrock or Stumbling Block? 02 Apr Peter: Bedrock or Stumbling Block? 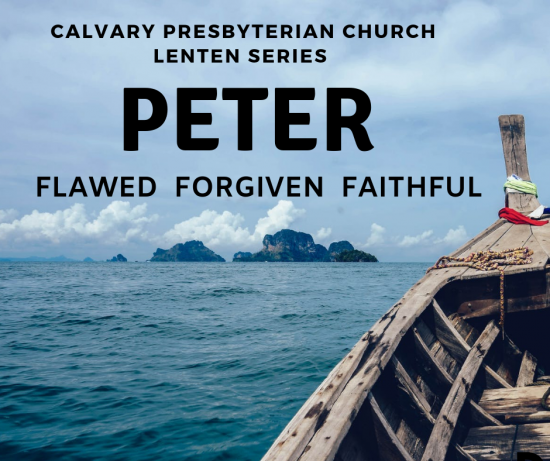 Welcome to the fourth Sunday of our Lenten series looking at the life of Simon Peter. If you’ll recall, when we left Jesus and the disciples last week, Peter was no-doubt feeling on top of the world. After he voiced the conviction that Jesus was the Messiah, the Son of the Living God, Jesus commended Peter for his insight and understanding, then went on to proclaim that Peter would be the rock upon which Jesus would build his church. Not stopping there, Jesus gave Peter the proverbial “keys of the kingdom,” which was a way to acknowledge Peter’s authority in front of the other disciples. Who could blame Peter for puffing out his chest a little, for feeling pretty good about himself right about now? But then Matthew’s story abruptly changes direction. “From that time Jesus began to show his disciples that he had to go to Jerusalem and suffer many things from the elders, chief priests, and legal experts, and that he had to be killed and raised on the third day” (16:21). This was shocking, disconcerting, unnerving news to the twelve. Based on the multitudes that had been gathering to hear Jesus teach and the amazing healings and miracles he was doing, the disciples expected Jesus’ leadership and popularity to continue to grow. They were anticipating a religious reawakening among the Jews, accompanied by political liberation from the Romans and the establishment of Jesus’ new kingdom. And they would have a front row seat for it all, plus positions of authority and responsibility. What they were not expecting, what they could hardly conceive of was that Jesus would suffer and be put to death by the religious establishment in Jerusalem. It is tragic but given the arc of human history, perhaps not altogether surprising, that the religious leaders of Jesus’ day would be the ones to insist upon his death. Jesus had, after all, challenged their interpretations of Scripture. His actions, particularly his violations of their Sabbath rules, had rubbed them the wrong way. His association with sinners and outcasts was deemed impious, despite winning the hearts of many in the crowd. His popularity had also raised the religious leaders’ insecurities, and his occasional critique of the scribes and Pharisees had won him few friends among them. History is littered with stories like these of ultra-religious people missing the point, and ultimately acting in ways that are the antithesis of God’s character of unconditional love. It is a warning to us all to remember that religious zeal, when coupled with an absolute conviction that one is right and an amnesia of God’s call to love others, can lead religious people to do very irreligious things. The Crusades, the Inquisition, pogroms, religious wars, burnings at the stake—it’s all been done in the name of a crucified Messiah who called people to love their enemies. And of course, Christians aren’t the only ones. Nearly every religion has its zealots ready to destroy, in the name of God, those with whom it disagrees. Atheists often level this as a critique against religion, but there are atheists who are as adamant in their orthodoxy as any fundamentalist, and there have been millions slaughtered in officially atheistic regimes in the name of ideological purity. Beyond the religious sphere, we see this same impulse today in the political and ideological polarization in the United States and in numerous countries around the world. We seem to have misplaced the concept of disagreeing agreeably, of mutual respect independent of position, of looking for common ground or working for the good of the whole. Instead, personal insult, name-calling, and distortion of the truth if not out-and-out lying is the status quo. And we somehow keep a straight face when we call ourselves a Christian or even an enlightened nation. The disciples may have been shocked by Jesus’ prediction of where his actions were heading, but Jesus himself was not. He knew what would happen if he were to faithfully preach the kingdom of God in Jerusalem. He knew it would lead to his death. He had not only reconciled himself to that fact, but he believed that his death would actually serve God’s redemptive purposes—that his death would draw people to God. But the disciples could not see any of this. They did not understand. And so Peter, the man who had boldly proclaimed that Jesus was the Christ, who had just been given the keys to God’s kingdom, took hold of Jesus and scolded him, to set the record straight: “God forbid, Lord! This won’t happen to you” (16:22). This is a pattern that repeats itself in Peter’s life with some frequency. After taking a great step forward in faith, he takes a step back. He just cannot process the idea of the Messiah, the Son of the Living God, also being a suffering Messiah. Once again, we see both the faithful and the flawed sides of Peter. He correctly and boldly proclaims that Jesus is the Messiah but at the same time cannot conceive of what kind of Messiah Jesus is or the mission Jesus has come to pursue. In this interaction Peter doesn’t just speak to Jesus; he “takes hold” of him. He scolds Jesus, takes him to task for not doing things the way he, Peter, imagines they should be done. Think about this for a minute; really put yourself in this scene. Here is Peter reprimanding and correcting the one who walked on water and calmed the storm. Bold and foolish; faithful yet flawed. Jesus wastes no time and minces no words in his response to Simon: “Get behind me, Satan. You are a stone that could make me stumble, for you are not thinking God’s thoughts but human thoughts” (16:23). From Peter the rock to Peter the stumbling block. That’s quite a fall. I can only imagine what Simon felt, but embarrassment, shame, and hurt might not be too far off the mark. This is why we love and relate to Peter so well, isn’t it? We see ourselves in this disciple whose heart is in the right place, but he doesn’t quite get it, isn’t thinking the way God thinks, even though he assumes he is. Like Peter, our tendency is to assess the situations we face from a very human perspective. There are times we make important decisions based on our own logic, failing to spend time in prayer or seeking to understand God’s thoughts on the matter which might be quite different from our own. In Peter’s case, he couldn’t yet comprehend that the transformation of the world that Jesus sought to bring would come via suffering and a cross. What was Satan up to in the wilderness? He offered Jesus success without suffering and a crown without a cross. How alluring that must have been. Of course, it came with a price—to bow down to Satan, an offer Jesus rejected. Here we are three years later, and it is Jesus’ own disciple, the man who is to be the rock upon which the church is built, who is encouraging Jesus to pursue the crown without the cross. Peter, of course, isn’t intending to lead Jesus astray. He is simply using his own human logic and doing his best to look out for his friend. Peter wants to spare Jesus—to spare him pain, spare him suffering. Think about how often we act out of the same impulse with people we care about. So, we counsel our children or our friends against the hard choice, the one we know lies on a path that will be difficult and might cause pain. But are we certain the hard path is not the very one God is calling them to follow? This scene in Simon’s life provides a cautionary tale about thinking we know more than we do about how God works. This scene also speaks profoundly to what we value. Jesus’ driving value was not what was easy, safe, or would make him happy. It was what would honor God and accomplish God’s purposes. He believed that his suffering, death and resurrection would be used by God to redeem, save, and transform the world. And he calls his disciples to follow in his footsteps. Again, Jesus doesn’t mince words; he tells it like it is: “All who want to come after me must say ‘no’ to themselves, take up their cross and follow me” (16:24). Is there a harder challenge Jesus could give us? The truth is that we prefer self-fulfillment to self-denial; playing it safe to suffering and sacrifice; comfort and convenience to personal cost. We’re happy to follow Jesus provided it means blessings and bliss, hope and love, forgiveness and mercy. We want our religion to bless us, but not ask anything too hard of us in return. And here’s the thing: practicing our faith, walking with God, being part of a community of saints—these things do provide blessing and joy, goodness and mercy. I’ve experienced care, compassion, and joy in spades because of being part of a family of faith—more than I ever imagined and certainly more than I could possibly deserve. But, if my faith is authentically Christian, it will lead me to live and give sacrificially, to choose a life of servanthood rather than one that’s all about me and my needs and wants. It will ask me to make decisions in answer to the invitation of Jesus that sometimes, truthfully, I don’t want to make. Please hear me carefully: the point is not pain and sacrifice for the sake of pain and sacrifice. The point is that to gain our lives, we have to lose them. The fulfilling, meaningful life we long for is found in self-denial and sacrifice, in loving and serving God and others. Deep in our souls we know this to be true. We’ve discovered that in those times when we have given of ourselves for the sake of another, we find a deeper, more lasting joy than we ever find in self-indulgence. It’s the kind of joy that makes us fully alive, that gives us a satisfaction that can never be purchased at the mall or achieved on the job. Perhaps that’s because, in those moments, we are living the way God always intended for us to be human. The cross of Jesus Christ is counter-intuitive, and it is certainly counter-cultural. But if you want to follow Jesus, it is the only way. So, what will it be? Bedrock or stumbling block? Your way or God’s way? “Get thee behind me, Satan,” or “Well done, good and faithful servant”? The choice is yours.